Described as one of Cuba's most highly regarded trumpet players of his generation, Miguelito Valdes has participated in more than 50 CDs in Cuba. In 1993 he recorded his first CD at the age of 18 with the group "Jelengue", receiving excellent reviews. Later, he joined two of Cuba's more prolific trumpet talents, Alexander Abreu and Yaure Muñiz, to form one of the most renowned of Cuba's recording teams. Miguelito participated in the award-winning recording "La Rumba Soy Yo", which won a Latin Grammy in 2001. In 2000, he began playing with Omara Portuondo (Diva of Buena Vista Social Club) with whom he toured the world for 6 years. 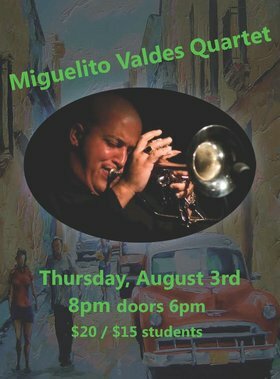 He has also played with important musicians abroad including Michael Brecker, Herbie Hancock, John Patitucci, Danilo Perez, Wayne Shorter, Wallace Roney, Brian Blade and, from the Latin scene, Michael Stuart, Gilberto Santa Rosa, Ricardo Lemvo, among others. In 2005, had the opportunity of participating in the recording of the CD named “Rhythms del Mundo” with musicians like Sting, Clodplay, U2, Maroon 5, just to mention some.